Everyone in Melbourne has posted a picture in front of the MCG, the skyline from Princes Bridge, Flinders Street or the Royal Botanical Gardens. However, if you want to get ahead of the curb, there are some secret places that can get those likes blasting. We have put together the ultimate Instagramable Melbourne insider guide. This is for those who want some unique social media worthy shots. 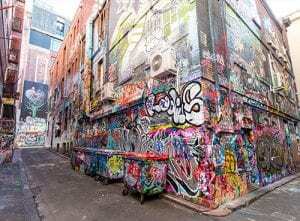 Hosier Lane is one of the more well-known secret spots in Melbourne. In fact, Ed Sheeran played a private live show there earlier in the year! However, it is still one of the most Instagramable spots in Melbourne, as it exemplifies the culture of the city. In Hosier Lane, artists are celebrated. There are ever-changing graffiti that are displayed on the walls of the buildings. They change so much, you’ll have to come back more than once! Even though this destination is on one of the busiest streets in the Melbourne CBD, 333 Collins Street is not that well known among the locals. 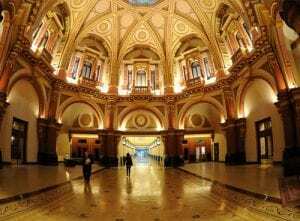 However, take one step inside, and you’ll be telling everyone you know about this breathtaking building. The lobby of this prestigious office building is truly remarkable. Built in 1891, 333 Collins Street will satisfy those who have a taste for classic architecture. As well as more modern installations such as in-wall waterfalls. If you’re a fan of both Instagramable spots and hidden bars, visit the secret Ponyfish Island under the Southbank Pedestrian Bridge. Not only can you take pictures on the Yarra River, but you can take some classic food snaps. There are delicious, rotating food options Ponyfish Island have on their menu. Melbourne have many secret rooftop bars where you can have a drink, and take some pictures of the city skyline. Appropriately named, Rooftop Bar is right in the heart of the CBD. Guests can enjoy drinks, burgers and movie screenings, and take some photos of the city lights. For something a little fancier, Madame Brussels serves dazzling cocktails on the roof among a garden backdrop. For a view of the entire Melbourne CBD, head out to Fitzroy and nibble on tapas at Naked in the Sky. You’ll be able to take a picture of the entire Melbourne skyline! Even though Flinders Street and Southern Cross Station are pretty spectacular to look at, there are more unique train stations and tunnels across Melbourne that are worth Instagramming. Bunbury Street rail tunnel in Footscray features surrounding tunnel walls that are covered in graffiti. This is amongst the backdrop of the CBD skyline. If you ever climb up the escalators of Parliament Station, take a picture as you begin to ascend, and you’ll see exactly how steep it is. Outside of Melbourne, spend the day in Belgrave and take some pictures on the Puffing Billy Railway, which has been around for more than 100 years. Save up to 35% on stays in the Melbourne CBD until 30 June 19 with our Here, There and Everywhere sale. Sale ends 26 April 19.